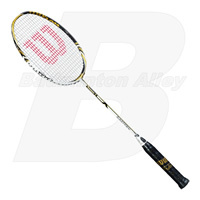 BLX is the new Wilson badminton racket technology engineered with BASALT fibers also combining proprietary frame, grommet and grip technologies for THE PERFECT FEEL. Basalt is a natural volcanic rock that can be used in manufacturing and made into ultrafine gold fibers. Basalt fibers are woven longitudinally with Wilson exclusive [K]arophite Black to create the most advanced composite in the industry. Like noise-cancelling headphones are filtering out unwanted external noise, Basalt added to the matrix filters the unwanted extreme frequencies in the racket. BLX, the new Wilson technology delivers a cleaner feedback and better sensation. (BL) stands for basalt which is combined with (X) other variables and all are connected together for the PERFECT FEEL. Wilson's innovations allow their athletes to stay ahead of their competitors and keep improving their game. BLX is just another example of how Wilson continues to provide professional badminton players, as well as millions of players around the world, with the most revolutionary technology. "Playing the Recon BLX for the first time, I realized how the perfect feel elevated my power and control on court," said Sho Sasaki. "Only with perfect feel you can control your game. My new racket allows me to play with razor-sharp precision and maximum power." "I fell in love with the new Vertex BLX immediately. The perfect feel I have playing this racket put my game on a whole new level", Jonas Rasmussen said after trying his new racket. "As a doubles player I have to adapt quickly during the game and the Vertex BLX provides that versatility I require to be successful."